Great Lakes Ice Won't Give Up! Ice remains on Lake Superior. Satellite courtesy of NASA/MODIS. Well it is now early June and air temperatures across the northern Great Lakes have already surpassed 80 degrees. Unfortunately, the lake ice hasn’t received the memo that warmer weather has arrived. 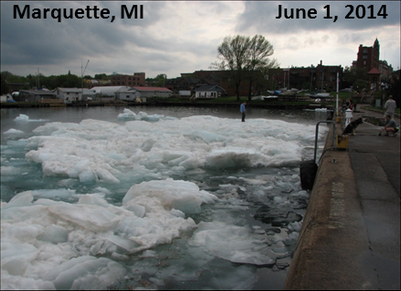 In fact, even on June 1st, Marquette, MI still had chunks of ice floating near the coastline of Lake Superior! 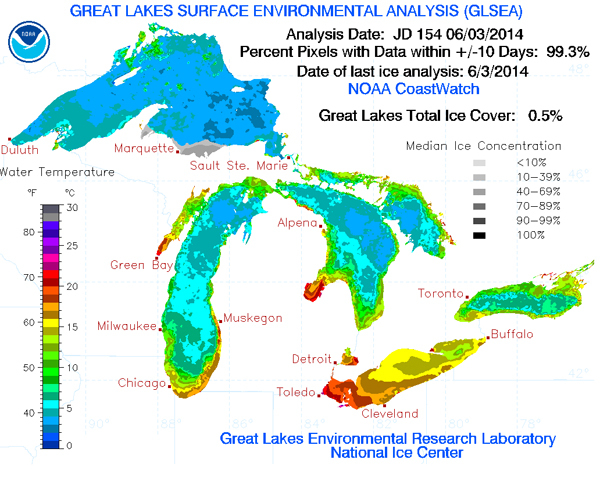 Great Lakes ice coverage and water temperatures as of June 3, 2014. The gray areas along the south shore of Lake Superior indicate areas of lake ice. Courtesy of NOAA/GLSEA. As of June 3rd, ice coverage on the Great Lakes is down to 0.5%, with Superior claiming all of the residual ice with 1.34% coverage. In contrast, the coastal waters of Lake Michigan have risen into the 60s with even 70s reported on Lake Erie! 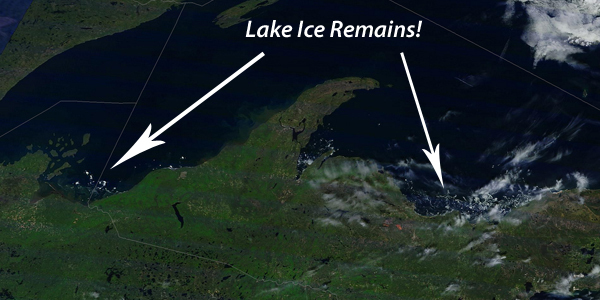 Lake ice into June is certainly rare, as the last time ice was present this late in the year was back in 2003. Undoubtedly, the long lasting ice is a result of the brutally cold winter. Looking back at the 2013-14 winter season, polar air was locked in over Marquette, MI with highs failing to rise above freezing from December 6th to February 18th. This 75 day streak is remarkable, but to make matters worse, below zero readings were reached 65 times over the winter season! Residual ice along the docks in Marquette, MI June 1, 2014. Image from NWS Marquette, MI. As June continues, it is inevitable the ice on Lake Superior will succumb to the warmth of summer. However, with water temperatures running below normal due to the late season ice, cooler than normal lake breezes will certainly destroy some of those beautiful early summer days across the UP of Michigan.